Ryan Glowacz, one of our Assistant Principal, sits in a meeting for a discussion on the new Taft School for freshman. 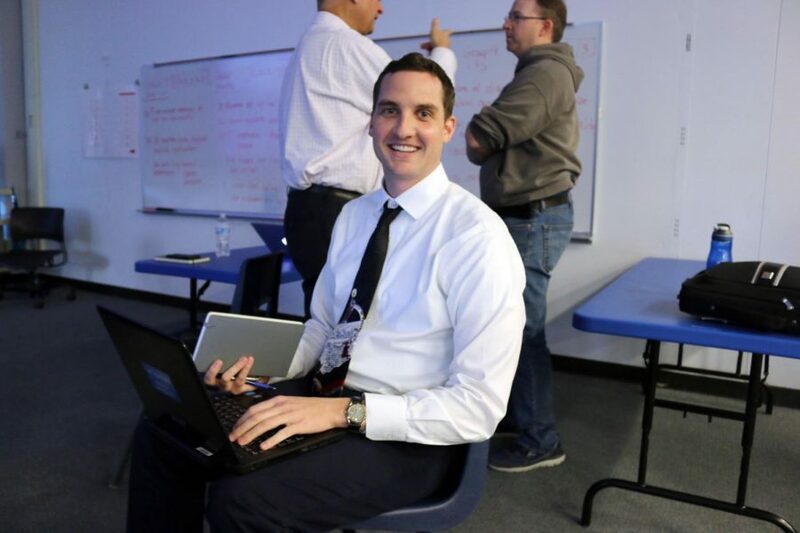 Former 2006 Taft graduate Ryan Glowacz becomes an Assistant Principal after four years of being the Athletic Director and Academic Center Chair. In Glowacz’s freshman year, he became a member of the NJROTC program and IB Diploma Bound Program, of which he was the only student in his class who earned the IB diploma and ranked eighth in his class. Glowacz was recognized among students and staff for outstanding academic record and extracurricular involvements, such as competitive Irish dancing. He was also the quarterback for the football team, all four years and he spent three years on the baseball team and one year on the swim team. “I have always tried to push myself to the top of anything that I am doing and that was definitely the case in high school. I was determined to earn the IB Diploma and make the most of my time in athletics, especially in football,” said Glowacz. Glowacz now work alongside some of his high school teachers including Spanish teacher Ruby Carlson, who taught Glowacz his senior year, and described him as “very outgoing and focused on what he was going to do… Ryan Glowacz was pleasant, I don’t think you can say anything negative about him. He was almost like the perfect student. He was known for his academics and any teacher you would talk to would say Ryan was going to somebody very important.” Glowacz was a member of the National Honors Society (NHS) which is an organization where students can earn scholarships due to excellent academic standings, as well as service within their school. He received the NHS scholarship and attended Lake Forest College. There he earned a Bachelor’s Degree in History and Secondary Education. Moving forward, he got a Master’s degree in Education from Concordia University in River Grove, where he obtained his Principal’s certification. Now as the Assistant Principal, Glowacz is responsible for being the Academic Center Coordinator, Administrator over the Athletics and Clubs and activities, such as the overseer of Open House, Homecoming, Report-Card Pickup, and Freshman Connection. Some new plans he is working on with other Taft faculty for the 2019-2020 school year involve opening the freshman campus, as well as completing the athletics facility upgrades, which include the tennis and turf field. He continues his involvement within the student body. Any student’s concerns can be discussed in his office, located across the second entrance of the lunchroom, in room 264.